Our European Debut July 3 at the Haarlem Choral Biennale We have some exciting news. On July 3 we will step onto a European stage for the first time, bringing Aniara: fragments of time and space to The Netherlands. Just one week after the premiere in Philadelphia, our entire production will travel to the Haarlem Choral Biennale. This marks an historic moment for The Crossing as well as a joyful advancement of our four-year project, Aniara, which will journey to Europe again in September for performances at the Finnish National Opera. Our tale of a colony leaving the dying earth and finding themselves lost forever to space becomes an international message of warning, hope, and connectivity. Dank je! This fantastic voyage premieres at Christ Church Neighborhood House in Philadelphia on June 20, with five performances in four days. Info and tickets at aniara.crossingchoir.org #ComeHearNow #Aniara_fragments #Weekly_Aniara Klockriketeatern 2 days 9 hours ago. Aniara: fragments of time and space Costume Designer Erika Turunen on the look and feel of Aniara's intergallactic crew. Premiere 6/20 in Philadelphia w/ Klockriketeatern. Finnish National Opera (Ooppera & Baletti) in Helsinki, this September. More info and tickets at aniara.crossingchoir.org #ComeHearNow #weekly_Aniara #Aniara_fragments Video by Four/Ten Media Major support for Aniara provided by The Pew Center for Arts & Heritage 3 days 12 hours ago. A Crossing Day of Gratitude We remember. And we celebrate. Five Years. April 14 is a big day at The Crossing. Perhaps the biggest. It's the day we lost Jeff, now five years ago, in LA, on the sunniest of days, on a morning of great anticipation and joy, preparing for work at Disney Hall with friends - the LA Phil and the amazing music of Louis Andriessen. Jeff at 42: Crossing co-founder, tenor, marketing guru, board member, friend, cook, partner. Each year since, we've marked the day with a lamentation, a remembrance, a wail. Not this year. The long-lived disbelief has modulated into enlightening memories and gratitude for him, for what he helped create at The Crossing, for what he left and what has followed him. We can feel it; we are able to laugh with him again. Shakespeare recognized this need so eloquently: "Moderate lamentation is the right of the dead, excessive grief is the enemy to the living." Moving forward, beginning Today, April 14 will be A Crossing Day of Gratitude. For legacies and visions, dreams and risks - and for the people who have in the past, who do now, and who will in the future expand our world through that uniquely human attribute: Imagination. Could he have imagined that, five years following, we would return to the LA Phil, as we will June 1 to sing a concert of composers Jeff admired so much: Toivo Tulev, Gabriel Jackson, Stratis Minakakis? (We're betting he could imagine that, with his mischievous smile beaming out from beneath the iconic mustache, and the knowing gleam in his eye.) April 14: A Day of Gratitude. Because the Spirit of Joy for each project and the Feeling of Anticipation for our future are with us and are stronger than ever. Because, Jeff. And, because Us, the Big Crossing Universe he seemed to know would somehow be here. And, here, we are. April 14. A Day of Sharing. Here is a track from our upcoming CD of Kile Smith's The Arc in the Sky: Mvt. 7, Jerusalem. Hear it again Friday, June 28 @ 5pm Church of the Holy Trinity, Philadelphia. Look for the CD on Parma records in July. If ever there were a bittersweet poem with a bittersweet setting... Jeff was fond of saying the better part of that word: "Sweet." "lovely, ruined Jerusalem lovely sad Jerusalem" We welcome you to remember Jeff at The Jeffrey Dinsmore Fund @ The Crossing: https://www.crossingchoir.org/jeffrey-dinsmore #ComeHearNow 6 days 12 hours ago. #ThursdayTrekking "now the ears of my ears awake" Joyful E. E. Cummings. Inspired Judith Weir. Brilliant marriage of playful text and whirling music. Today our Thursday Trek takes us back just a few months - to The Crossing @ Christmas 2018 and Judith Weir's "a blue true dream of sky" Judith's piece is a kind of collage, capturing the looping, exuberant self-interruptions of cummings' iconic poem "i thank you god for most this amazing day." Two trebles (here, the steadfastly beautiful Julie Bishop and Gabrielle Barkidjija) sing at a distance from the choir, anchoring the relationship between the full ensemble and a solo soprano (the soaring "dream of sky" Rebecca Siler). The improvisatory-sounding opening (again, just like cummings' words) celebrate nature - "the leaping greenly spirits of trees...everything which is natural which is infinite?" - leading to a "coming together" to ask a florally convoluted question: how should we (merely human beings, lifted from nothing) doubt (the unimaginable)? "how should tasting touching hearing seeing breathing any - lifted from the no of all nothing - human merely being doubt unimaginable You?" Recorded live December 16, 2018 by Paul Vazquez of Digital Mission Audio Services #ComeHearNow 1 week 2 days ago. Aniara: fragments of time and space "As we develop the text and the composition, and try to embody the story in tones and visions, in motion and stillness, the world around us gets, once again, wilder than fiction." Blog post by director and librettist Dan Henriksson #ComeHearNow #weekly_Aniara #Aniara_fragments Klockriketeatern Major support for Aniara has been provided by The Pew Center for Arts & Heritage 1 week 4 days ago. At first, two settings of the same words may seem odd album mates. But, owing to the riches to be mined in Hart Crane’s Voyages, two settings of this masterpiece of early-20th-century poetry complement each other in myriad ways. These are two major works from two of the most creative artists writing for voice today. As conductor Donald Nally remarks in his program note, “We’ve found thousands of ways to sing ‘Lord, have mercy.’ What are two ways of finding the music in, ‘the bottom of the sea is cruel?’” Indeed, that line is set so distinctly, so chillingly, by each composer that their individual world-views, expressed in counterpoint, linger long after the music has ended. Robert Convery’s Voyages follows Crane’s words verbatim, capturing the structure, exploring each poem as a miniature life lived, and focusing on the inherently musical meters of Crane’s dazzling vocabulary. Convery’s world is one in which subtle harmonic shifts open up forgotten emotional universes, and abrupt tempo changes instantaneously transform a serene moment to one of complex feelings and desperation. His focus on color would lead one to believe the work was written for The Crossing. For his Voyages, Cantata No. 2, Op. 41 Benjamin Boyle has created a cantata-like structure excerpting some of Crane’s most intimate and wrenching moments. With the addition of a string chamber orchestra, it feels as if Boyle has considered Crane’s words distilled and he has blown a kind new life into them – a very personal response to the feelings Crane hopes to evoke through imagery. The double-choir moment of “Meticulous, infrangible, and lonely” – in which the edges of a relationship become blurred and all seems like a memory – is as heart-breaking as music gets. The solo moments offer a wide range: fragile, vibrant, warm, hopeful – all executed here with virtuosity and breadth. 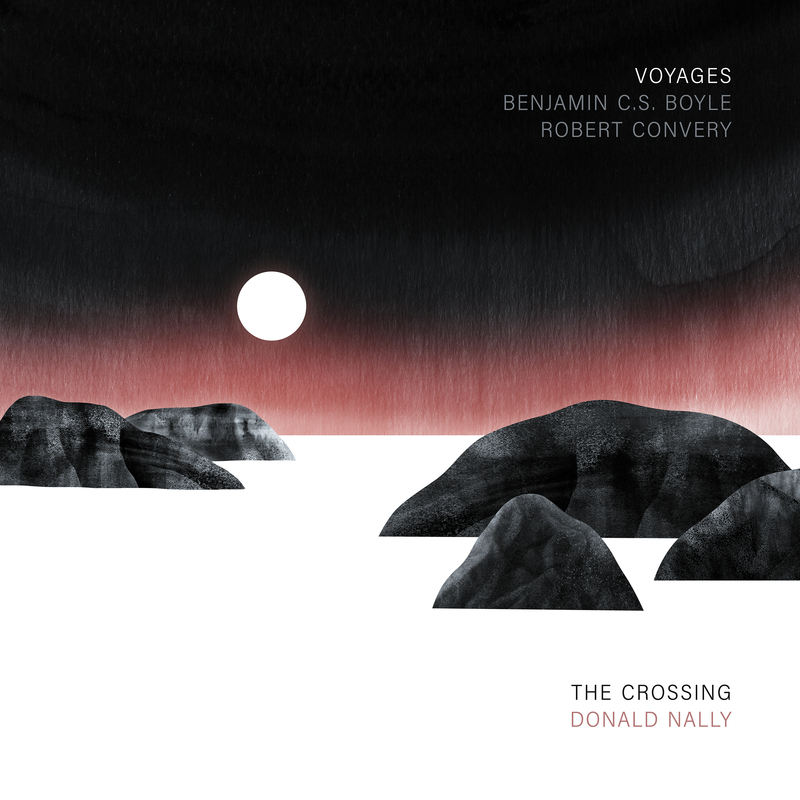 The Crossing is a professional chamber choir conducted by Donald Nally and dedicated to new music. Winner of two Grammy Awards for Best Choral Performance (2018, 2019), The Crossing regularly collaborates with some of the nation’s most accomplished ensembles and imaginative composers. Recent work has included the LA Philharmonic, the New York Philharmonic, Helsinki’s Klockriketeatern, the Haarlem Chorale Biennale (Netherlands), and the Park Avenue Armory. The ensemble is committed to working with creative teams to make and record new, substantial works for choir, most often addressing social issues. The Crossing, with Donald Nally, was the American Composers Forums’ 2017 Champion of New Music.